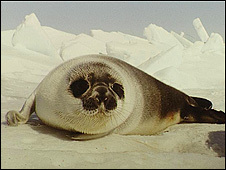 The European Parliament has voted to ban the sale of seal products in the 27-nation EU. The legislation follows lobbying by animal welfare groups, which have long argued that the clubbing of seal pups by hunters is barbaric. Canada kills about 300,000 seals annually off its east coast - the biggest such hunt in the world. The EU law would exempt seal products from Canada's Arctic Inuit community, who are traditional hunters. The vote - 550 in favour and 49 against - threatens to overshadow EU-Canadian trade talks opening in the Czech capital Prague on Wednesday. The proposed ban still requires the agreement of EU ministers to take effect. But it is likely to be imposed before the 2010 hunting season starts, correspondents say. An Inuit delegation from Canada's Nunavut territory tried to persuade MEPs not to back the ban. A delegation member, Joshua Kango, said a European ban in 1983 on the import of whitecoat and blueback seal pelts had hit the Inuit hard, despite a similar exemption. He said the exemption "didn't stop the market collapse, and the hardship and the suicides that followed throughout our communities". Labour MEP Arlene McCarthy, who helped draft the new EU ban, said "the vast majority of people across Europe are horrified by the cruel clubbing to death of seals and this law will finally put an end to the cruel cull of nearly 300,000 seals a year". Canada has threatened to complain to the World Trade Organization (WTO) if the EU ban goes ahead, the AFP news agency reports. Besides Canada, seal hunting is also big business for Greenland - a Danish territory - and Namibia. Seals are hunted not only for fur, but also for the production of gloves and Omega-3 fatty acid supplements. In the EU, seals are culled on a much smaller scale in Sweden, Finland and the UK, mainly for fish stock management. The International Fund for Animal Welfare says the EU ban will not apply to such culling, which comes under "sustainable management of marine resources". The MEPs' move is a follow-up to proposals last year from the EU's Environment Commissioner, Stavros Dimas. He said his office had received thousands of demands for a ban - mostly from campaigners in the UK, the US and Canada. Anti-hunt campaigners say some seals are skinned while still conscious. Hunters typically shoot the seals with rifles or bludgeon them to death with spiked clubs. The animals' pelts, fat and meat are traded. Belgium and the Netherlands have already banned seal products and the United States has banned Canadian seal products since 1972.